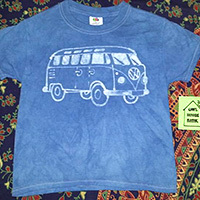 Batik cotton clothing for babies and kids with hand drawn original designs. Look for onesies, shorts and dresses. I hand batik fun cotton clothing for babies and kids with my hand drawn original designs, soywax and procion dyes. Onesies, shirts and dresses. Everything is Preshrunk, ready to wear & look cute on all children. Regular wash on any temp. Won't bleed or fade. I also add a design to the back and sometimes the sleeves too. For the Moms I Batik silky soft rayon sarongs, lightweight enough to use as a scarf too!